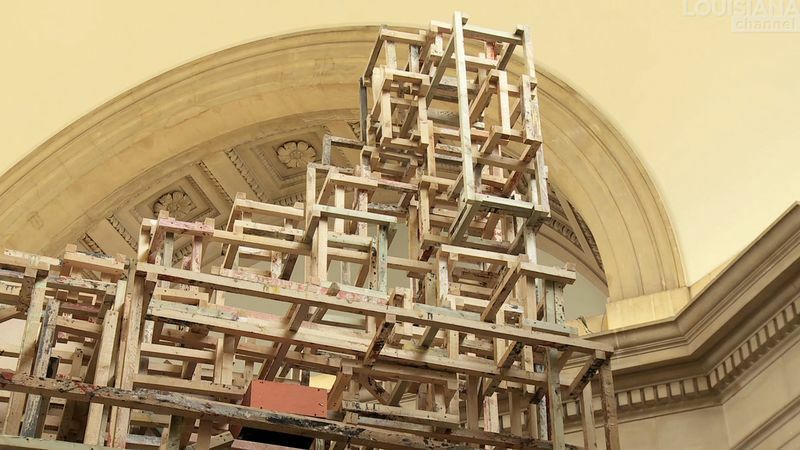 Phyllida Barlow’s new exhibition ‘cul-de-sac’ at the Royal Academy features stripped back sculptures that balance and tower over three gallery spaces, inviting visitors to walk around and look upwards. Theatrical, brightly coloured fabrics greet an audience at the entrance, while other forms stand white, grey and erect, extending towards the arched ceilings. 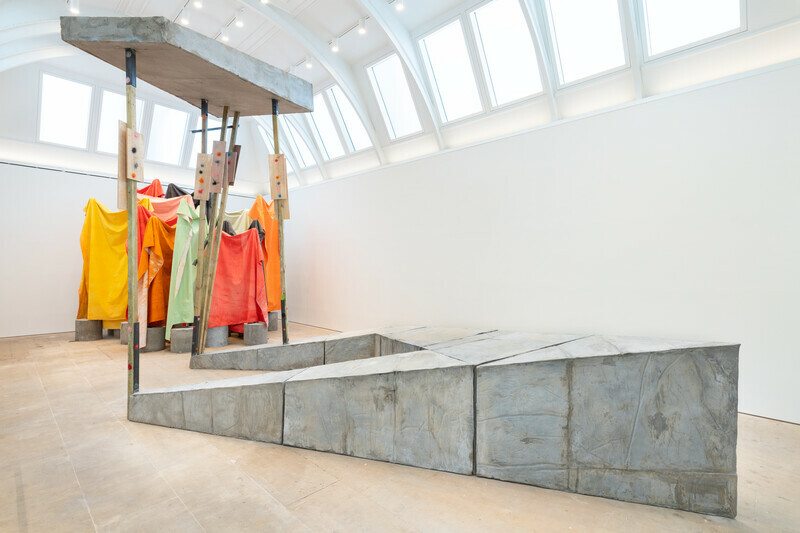 An array of sculptural components – cylinders, industrial blocks, plinths and columns – appear in raw form, collectively filling the space and marking a significant evolution in Barlow’s practice. The documentary ‘Phyllida’ follows the artist over a period of four months in preparation for the exhibition, where it will premiere. Directed by Cosima Spender, the film maps the roots of Barlow’s oeuvre, as she revisits childhood memories, domestic and urban spaces, and their subsequent effect on the creative process in her studio. 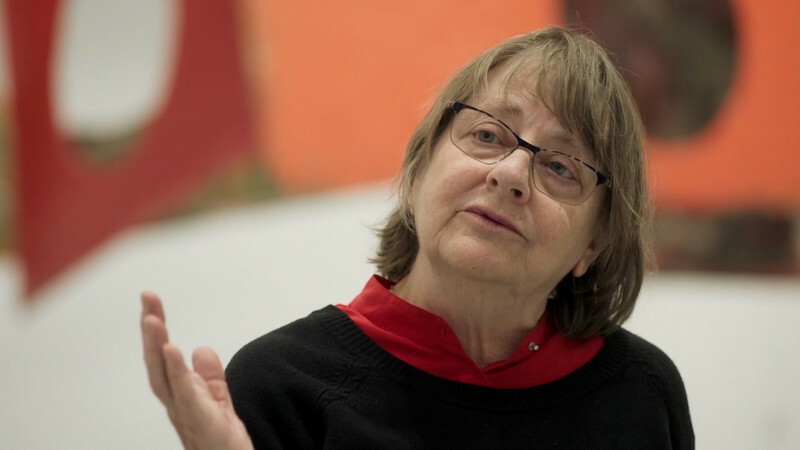 Barlow began studying at Chelsea College of Art in 1960, and subsequently went on to study and teach at Slade School of Art for more than twenty years, becoming Emerita Professor in 2009. 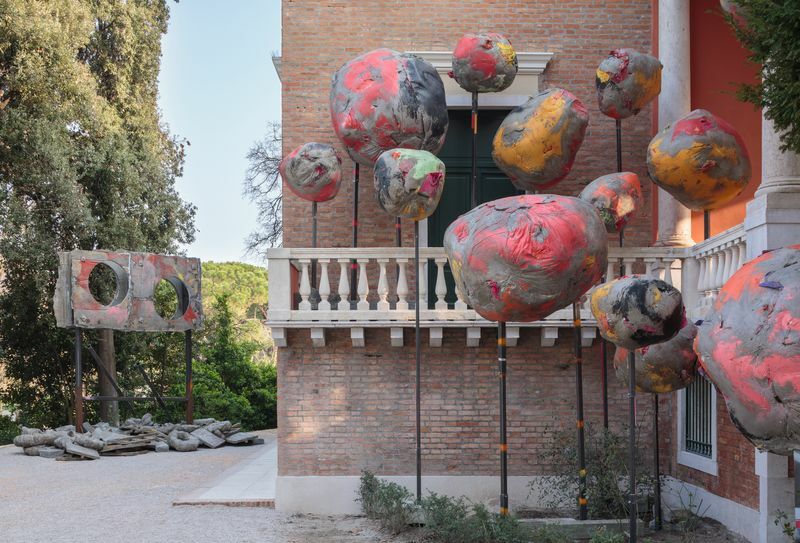 She was elected a Royal Academician in 2011, and represented Great Britain in the 2017 Venice Biennale, where she created the ambitious installation, ‘folly’. 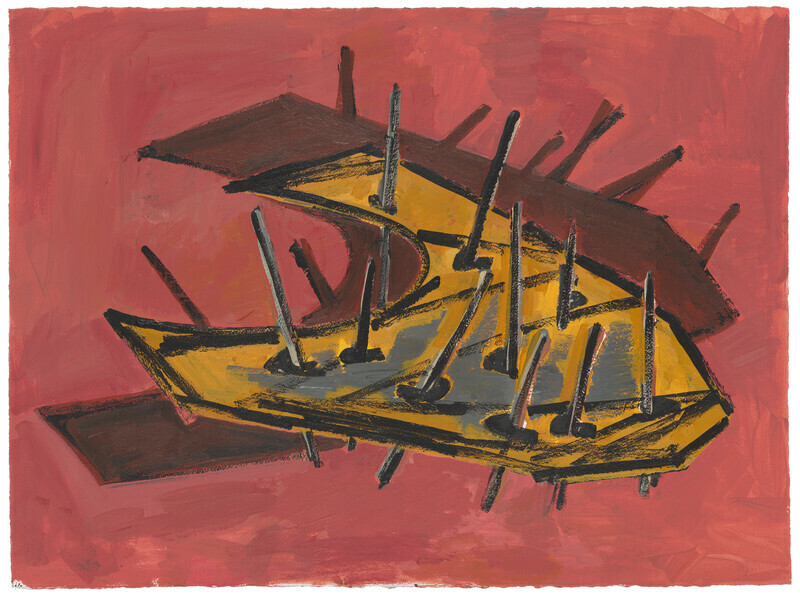 This evolution, the artist’s influences and childhood are elucidated in the film, where the viewer receives a sharpened sense of Barlow’s personal history. 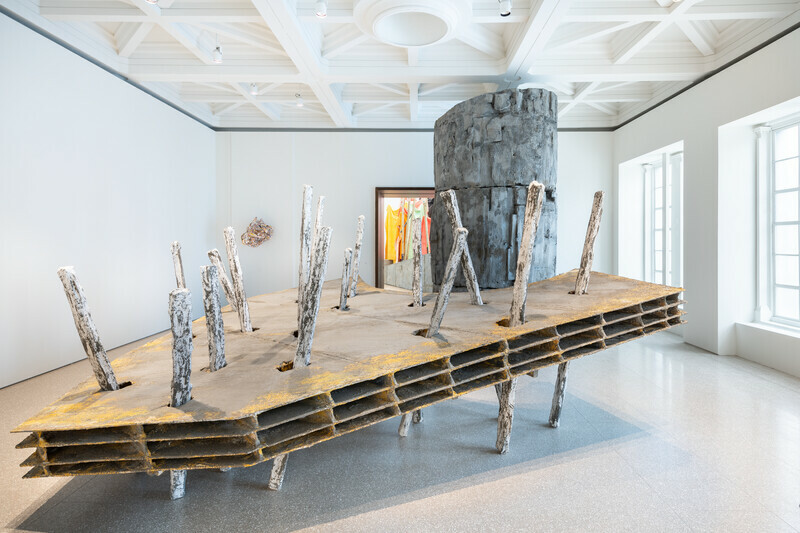 Barlow’s work has an astute historicity, and yet is also grounded in the moment of inception, as she reiterates: ‘I don’t think I have a ready-made subject that I can proclaim – the subject is hard won through the processes of making’. 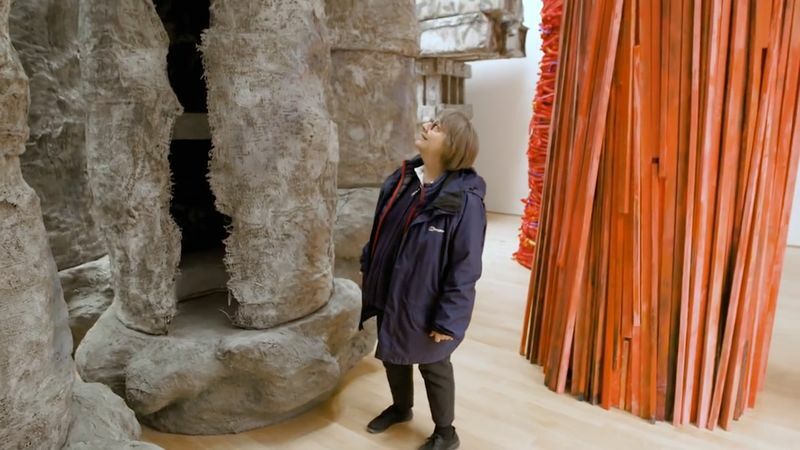 The documentary depicts Barlow rolling a large, plaster structure onto the floor of her studio, heightening the importance of play and chance in the artist’s direct and intuitive process of making. Leftover pencil marks and felt tip writing on the wooden constructions trace the past life of the material. 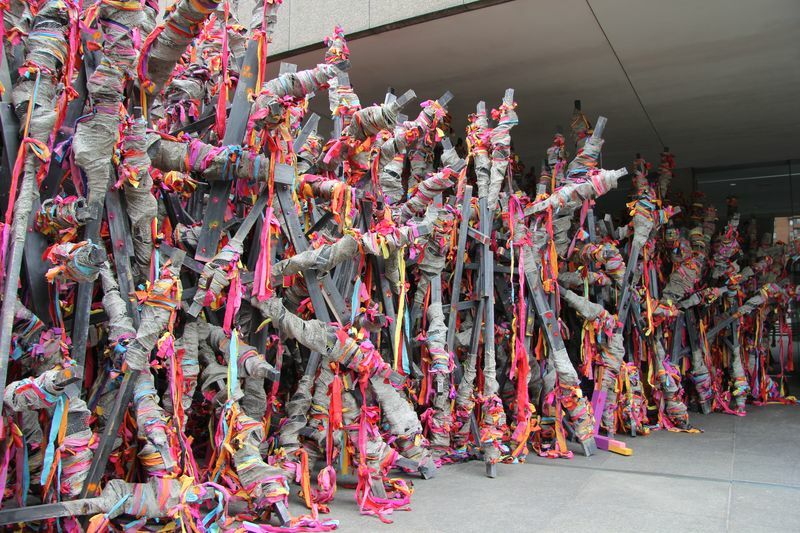 Throughout her career, Barlow has created work using everyday materials such as cardboard, fabric, plywood, polystyrene, scrim and cement. 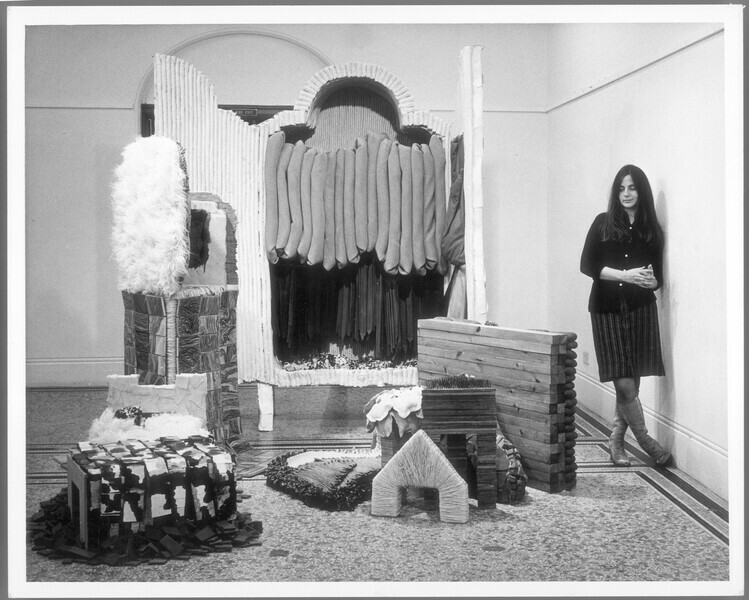 On the genesis of her interest in material, Barlow recollects: ‘My grandmother had a cupboard under her stairs, and I can remember vividly that she kept every single thing that could be reused, like candles of various lengths, along with rubber bands, lid tops, jars; everything was of value.’ Transforming these materials through layering, accumulation, and juxtaposition, Barlow’s large-scale sculptures move away from conventions of serenity and balance, favouring instead the creation of a sense of instability, obstruction and incongruity. 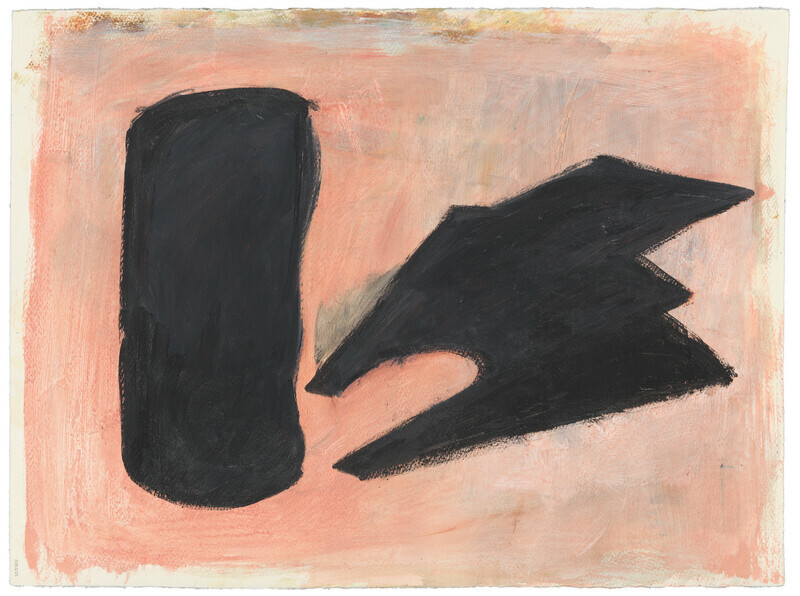 Curated by Edith Devaney in close collaboration with the artist, ‘cul-de-sac’ is on view at the Royal Academy, London, from 23 February – 23 June 2019. ‘Phyllida’ will be screened at the Royal Academy Lecture Theatre between 11am and 3pm on Saturday 23 February, and on Friday 1 March, from 6 – 10 pm in the Clore Learning Centre. The film is free for members of the public to view.